With the imminent release of Apple's iPhone, the gamble will be how well the touch screen works with only a finger tip since no stylus is included. Our Windows Mobile devices have had touch screens since their introduction in the mid 90's. Although, a stylus is still required for most applications, each successive version has brought the promise of one handed and finger tip operation closer to reality. One annoying problem for our keyboard less device, has been the lack of a useable finger tip friendly virtual keyboard. Prevalent Systems, LLC, has recently released version 2.0 of their Phrase-It virtual keyboard. Read my review on pocketnow.com to see how it performed! I have been using eWallet ever since it was bundled with my Compaq iPaq PDA and it is one of the key applications I use on my T-Mobile MDA. With the release of eWallet 5.0, Ilium Software has taken what I consider an excellent application to the next level. Windows Vista compatiblity. eWallet 5.0 works very well with Vista and the Windows Mobile Device Center and Sync Center. Higher resolution graphics. On my first use of eWallet 5.0 I was struck by the enhanced graphics. Although the application layout has not changed, the enhanced icon graphics make the application much more appealing. In addition you can now create card templates and add your own icons. Sync Pro has been enhanced to sync wallets to multiple locations. This is a feature I have long been waiting for. I store my important files on a server that is backed up nightly. I have been using Windows file sync feature for my eWallet data files which performed a full file sync. It worked but was not ideal since it did not take into card changes made to each copy of the wallet. Now with Sync Pro I can perform a card level sync with the ability to manage conflicts. You can also sync your wallets with an FTP server and Ilium Software's Files Anywhere service. eWallet 5.0 also works with the U3 secure USB flash drive technology. This is not something I have tried, but it sounds like an interesting concept. In today's identity theft ridden world, protecting user ids and passwords, as well as other financial information is imperative . eWallet does the job on Windows XP, WIndows Vista and Windows Mobile for my wife and I. Ilium Software has made a great application even better. My brethren over at pocketnow.com, Jeffrey Brent Swerdlow has reviewed eWallet 5.0 here. I concur with his 4.5 rating and agree that the returning to the file list when closing a wallet is a bit of a pain. Update: I just found out that an easy way to avoid the file list on exit is to use the lock feature (left soft key), this feature will exit you out of eWallet. Ilium Software has just released version 2.0 of Newsbreak. I have been using Newsbreak 1.2 for a while now and have been satisfied with its performance (I use it to view My Digital Life on my T-Mobile MDA. Version 2.0 adds podcasts and many new configuration items to manage the content of information. The new configuration items are very important given the minimal amount of storage space we have to work with on Windows Mobile devices. An Ilium Software major upgrade usually costs $10.00, however right now you can purchase Newsbreak 2.0 outright for $7.95. This is an excellent deal. While reading the Wall Street Journal on my T-Mobile MDA I found that mdog.com performs the rendering of the WSJ website for mobile devices. Mdog.com also acts as a search and directory engine of sites it can convert well on mobile displays. One of the news sites it has listed is washingtonpost.com. The Washington Post also has mobile site at http://mobile.washingtonpost.com powered by Crisp Wireless. It is interesting to see the difference renderings. The mdog rendered Washington Post site. The mobile Washington Post web site. It is also integrated with the major blog sites like typepad.com (my blog provider). My blog does not display well on mobile devices, however with mblog.com the content is nicely rendered. The blog posting feature only allows you to post simple text. In the last two weeks I noticed that my T-Mobile MDA was getting progressively slower and that the boot up time was getting really long. I started looking for causes and found that my device was alarming for no reason and that scheduled reminders were not alarming. From my research I knew that alarms and reminders were problematic for some users of Windows Mobile 2003 and Windows Mobile 5.0 device, I had never had these issues. I went searching for a utility that would read the alarm and reminder repository and found ScaryBearSoftware. 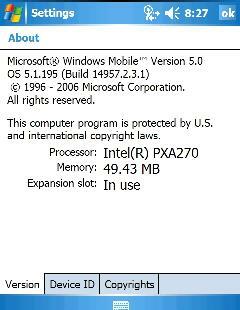 They provide two very helpful free utilities found here that were designed for Windows Mobile 2003 but seem to work with Windows Mobile 5.0. Check Notifications which displays the alarm repository and provides a clear function. Notification Clear Fix which you can place in the \Windows\startup directory to clean out your old alarms every time you boot. I first used Check Notifications, it read over 700 alarms in my repository. At this point I knew that this impossible and that my repository had somehow gotten corrupted. The program provides you three options to clear the repository. I checked all three, but you need to be careful since you could loose some valid alarms. By tapping clear you will delete all alarms based on the options you set. Make sure you have a backup of your system before proceeding. Everything is working fine for me now. I also placed the Notification Clear Fix in the \Windows\Startup directory. I should no longer have to worry about a corrupted repository. Microsoft releases Daylight Savings Time updade for Windows Mobile directly to users. Microsoft has released a patch for the new Daylight Savings Time here. They have chosen to bypass the OEMs, which is a good thing, although OEM's are free to provide the update as well. If you use desktop Outlook, read the article carefully since some of your appointments can be affected if you do not run the associated tool. Update 2/13/07: If you use Exchange make sure you ask your administrator or hosted Exchange provider if they have applied the DST patches before you proceed. I use 4smartphone.net as my hosted Exchange provider and they have applied all the appropriate patches. The Achilles heel of the Windows Mobile platform is memory utilization. The Windows Mobile Team has posted several good explanations of the different issues. Why Persistent Storage Is A Good Thing - A description of the persistent storage model used in Windows Mobile. RAM, ROM, NAND, NOR--that's a lot of capital letters... - An explanation of the different types of memory used in a Windows Mobile device. How the Windows Mobile 5.0 Shell Handles Low Memory Situations - An explanation of how the OS handles low memory conditions and the thresholds which can be set by the OEMs. The MDA has 128MB of ROM and 64MB of RAM. T-Mobile has allocated 47.46MB of the ROM to storage memory and 44.01MB of RAM to program memory. This means that the Extended ROM and OS image take up 80.54MB. On the storage memory front, the OS takes about 20MB, leaving 44.01 for the T-Mobile environment and user programs to run. With Xelencin's custom 2.26 ROM we are left with about 23.35MB for user selected programs. I wrote a post about memory back in February which had some misconceptions about ROM and RAM which the Mobile Team's post cleared up for me. Memory management by the user is a fact of life. With the price of Storage Card memory dropping all the time, I upgraded to a 2GB Mini SD card. I only install key application in Storage Memory and the rest on the SD card. One of my tweaks redirects the Pocket IE cache to the SD card which helps tremendously. I also store all my email attachments on my storage card (inbox/menu/tools/options/storage). You can also move your Outlook E-Mail inbox to the storage card using this tweak found on identitycurve. I have not tried this yet. When I first started syncing my T-Mobile MDA directly with Exchange server (before Direct Push) via ActivySync on my PC, I found that more often than not I was unable to complete the synchronization. I would receive error code of 85020006. This never really bothered me since the MDA is a PPC phone and I synchronized with Exchange over GPRS or WIFI. Once I upgraded to the first AKU 2.3 ROM (2.24) I noticed that I was no longer receiving the error when syncing with my PC but never thought much of it. When I purchased my T-Mobile MDA, I gave my wife my Dell X51v which was running the AKU 1.1 A06 ROM. A couple months ago I decided to sign her up for a hosted exchange account at 4smartphone.net, the provider I use. The major impetus for setting her up with Exchange was the ease of use of viewing each others calendars and contacts. I had tried MSN, Google and Yahoo, all of them partially worked with Outlook on the desktop but not had a seamless experience. You would have thought MSN would have gotten it right but I had all sorts of issues with my contacts "File As" field. Another advantage of using 4smartphone.net, It would allow her to easily sync her mail, calendar, contacts, and tasks onto the X51v. The problem I encountered syncing the X51v via ActiveSync 4.1 on the PC was error 85020006. I could sync with Exchange using WIFI but that meant syncing twice, once with the desktop (for files, notes and mobile favorites) and once with Exchange. Not a very good situation for the casual user. Thinking that this might be an ActiveSync problem, I installed version 4.2. This did not resolve the problem. I did not have the error with my T-Mobile MDA and the only difference between the two environments was the AKU versions on the mobile devices, I decided to upgrade the X51v to Dell's A12 ROM which is based on AKU 2.3. Once upgraded the settings/about displays the build number which correlates to AKU 2.3 (see my post). The combination ActiveSync 4.2 and the AKU 2.3 based ROM has resolved the problem. 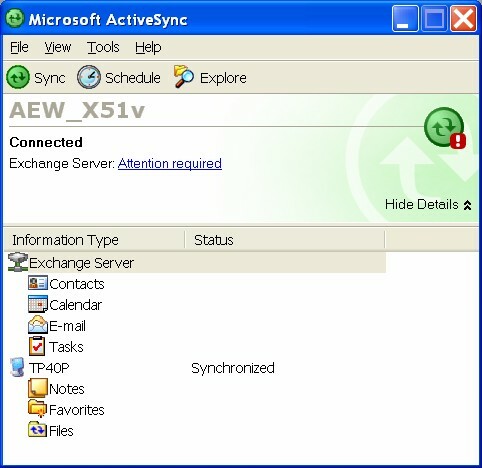 Now syncing once via Bluetooth accesses both data on the PC and Exchange. Unfortunately the X51v is not a PPC phone and does not currently support Direct Push. Microsoft is looking at the possibility of implementing Direct Push via WIFI, however there is concern about the effect this would have on battery life.